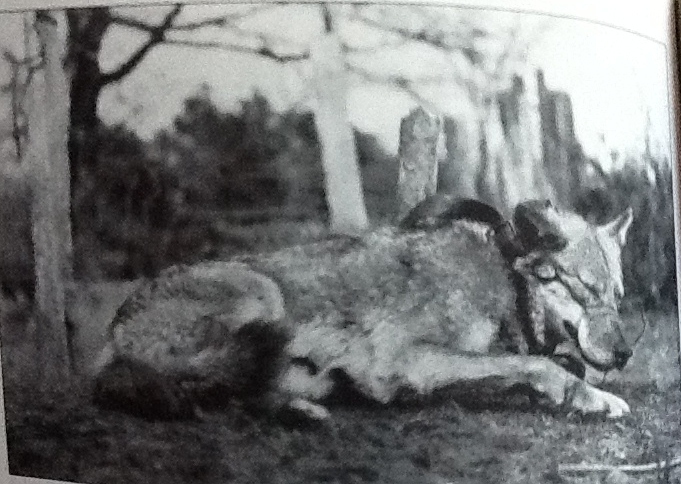 This photograph is of a wolf trapped near Gillham, Arkansas in 1929. The photo can be found in the National Archives in Washington, D.C, and it also appears in Bruce Hampton’s The Great American Wolf, which is history of the wolf in North America. It came out in 1997, just a few years after wolves were reintroduced to Yellowstone. The caption under this photo in Hampton’s text says that this animal was a “red wolf” that was captured in Arkansas in 1929. The area listed in the caption is in the Ouachita Mountains, which stretch from western Arkansas to southeastern Oklahoma. This animal had been captured, and then someone had bound its jaws shut with wire. Often, the dogs would be set on wolves in this particular position. On other occasions, they would turn the wolves loose and let them die of dehydration or hyperthermia. This particular animal is of interest because it is a photo of what is reported to have been a red wolf. However, it has none of the coyote-type features we associate with the creatures we call “red wolves” today. It has a broad muzzle, just like we see in other wolves, and its ears are relatively small. The skull is also broader and rounded, just as we normally see in wolves of other subspecies. This animal may have been red in color, but its phenotype suggests that it was all or mostly wolf– unlike modern red wolves, which look like slightly larger coyotes and, indeed, are almost entirely of that ancestry. This subspecies of wolf no longer exists, so we really can’t say much about it. It’s likely been absorbed into coyotes by now. The so-called modern red wolves are coyotes that have likely also absorbed a very similar wolf in Louisiana and East Texas. They just happen to have a bit more wolf in them than normal coyotes that have absorbed similar wolf populations. EVOLUTION! I find it kind of funny that people who accept evolution cannot accept that modern populations are still EVOLVING, in response to pressures that includes humans messing about. Yeah. Evolution didn’t just happen. It IS happening. Talking of evolution in action, Windhounds, there is news in our papers today concerning a considerable demographic shift recorded among America’s human population; wolves/coyotes and humans all evolving as we speak, it seems. But speaking more on topic, it would be interesting to get some update on dog/wolf mixes evolving in the mountains of Italy today. Anyone up on that? This picture was taken around the same time when original Rin Tin Tin was playing a wolf’s role in a silent movie, trying to protect its family. The hunters are making him run from land to land. Finally, he gets trapped in a snare. The lead hunter approaches him for the final kill, but then he opens up the jaws of the snare at the last moment and lets the ‘wolf’ go and vanish in the forest before others arrive. Of course, the movie was a super hit and catered to the taste of urban dwellers of that time. And of course there were rotten people living elsewhere too. White man and Muslims have inflicted worst atrocities on the wildlife in their respective golden and dark ages. The Mughal King Babar (February 14, 1483 – December 26, 1530) writes in his autobiography that he and his army were out trying to hunt down two Rhinos in what is present day northwestern Pakistan. The Rhinos took refuge in a 500 acres forest. The emperor then ordered his troops to set fire to the forest. That was done, the two Rhinos came out, and were easily killed with arrows and spears. Jim Corbett, who was well known to hunt man-eating tigers only, has written an account in his book ‘Man-eaters of Kamaon’ of hunting a tiger purely for its size. Very much agree, but Europeans can be Muslims– Bosnians and some Albanians are Muslim. That is true, but all I wanted to say is that it is mostly White men and Muslims who have killed most of the natural heritage in our lands and wherever we went. I am a Muslim by faith (my religion is humanity though), but have no qualms in saying that, for example, Hinduism was the best to the nature. They declared all their wildlife under threat as Gods thousands of years ago and their wildlife escaped annihilation at the hands of men. It was Muslim and European invasions to India that brought death and destruction to the nature there. I am unable to understand when native Indians were at peace with the wolves such as shown in the picture, why were the settlers so cruel to them. Surely wolf packs must have caused lot of trouble to the Indians, but they never attempted to wipe them out. Do you mean the natives of India or are you referring to American Indians (Native Americans)? In my last paragraph, I was referring to American Indians (called First Nations in Canada). The image of wolf in India was totally different, as projected in Rudyard Kipling’s Jungle Boy. I think that the Native Americans didn’t have any particular problems with wolves and often had a reverential attitude towards them. An exception would be the tribes of the South West that obtained sheep and goats from the Spanish. I am sure retrieverman would know more on the subject. I believe I read somewhere that the Navajo didn’t much like wolves– probably for exactly that reason. The Cherokee made fun of Europeans killing wolves. Didn’t they know that the deer were going to take over with no wolves to control their numbers? Yes, we know that Indian hindu culture requires respect for animals, good, but the dreadful caste system which reportedly exists years after being declared illegal shows rather less respect for fellow human beings and still, we are told, ruins the lives of millions of people in India today. I would just mention that the British rule over India ended in 1947 and the forced suicide of widows was still happening long after that, sadly. Maybe a lesser tragedy but not long now before the indian tigers are likely to become extinct, except maybe for a few of them surviving in zoos around the world. These things are not planned in advance and no one can be held accountable now for historical injustices, but I suppose the British did at least leave the legacy of a modernised India with as many English speakers, for example, there as we have here in Britain,I believe. And talking of death of women by burning alive, even now in the age of the internet we hear reports of young women in India being set alight by their inlaws due to some dispute about “wedding presents” being insufficient. I was in Munich in the December of 2010, and I was shown a place where the Catholic Bavarians had burned a Lutheran family at the stake. They put them on pikes– claiming that the reason why they were Lutheran was because the father of the family had been sodomized by the devil and the only way to purify him was to impale him and his whole family before setting them on fire. Which proves that no religion is perfect. I think you should see, at least sometimes, that every human rite, how awful ever they may seem – as natural population controlling systems, although happening within a culture. It’s not political or anything like that – or if it is, then, every “vertebrata” species has it. Human is a very overpopulated species and we all feel the pressure of that everyday, live we in Siberia or Africa. The nature resources are lessening. It’s so odd many people live like that wasn’t happening. When humans are taking over new land for their food and energy production, it means other animals have to leave that place. Animals are like aborginal nations used to be in the past centuries. Photos of wolves in steel traps pitifully lying there before being shot have historically been featured in old books, sometimes captioned with some triumphant statement glorying in this grisly aspect of “taming the frontier”. We’d like to think that mindsets had changed by 2012, but then one reads the clips copied onto this forum reporting the destruction of wolves now being organised north of the 49th parallel – and that dreadful picture seemingly displayed prtoudly here of that grinning individual who had just killed a wolf. And some of you question why I should be sickened by people hunting for so called “sport”?! Ghastly customs such as bear baiting featured in Europe’s less enlightened ages and have been abolished. However, in this most civilised country (I’d like to think) Britain it is only a few decades since badger baiting became criminalised. Bull fighting still goes on in present day Spain. Not much worse, arguably, than breeding show dogs to live in permanent discomfort and pain. And it is only a few years since we in Britain have insisted that pigs and poultry be given enough space to almost exist in comfort – although this is still a work in progress. And before anyone reminds me, yes I know that man’s historical in humanity to man is much much worse, but that is a subject for many other forums..
We were not hunters. We lived in the city so we got our hunting lore 3rd hand at best. However, there was this idea floating around that an animal that was stressed just before being killed would not taste good. The ideal was to kill the animal before it had a chance to process and react to the presence of the hunter. This picture is not about hunting. It is about vengeance. Maybe that wolf was a stock killer. Even at that, though, it is hard to understand how man could entertain such hatred for a simple animal. You may be right, Kathy in summising that unfortunate wolf could have been a stock killer. And actually there is also this ancient exaggerated fear of wolves seemingly hard wired into us humans which led us to hate them throughout history. Even though we are now have all the knowledge and sophistication of a society living in the 21st century, there are some of us who may always regard wolves with some residual hatred and fear – and even though many of us have a ‘wolf’ as our very best friend. One of my ‘wolves’ actually saved my life a few years ago when I fainted from low blood sugar while out walking late one February afternoon when it was freezing and the sun was going down. Instead of wandering off my ‘she wolf’ stayed right with me and howled until the only couple of walkers still out on that bleak hillside came over to investigate – and they were “lost” at the time, they said. I’ve heard it said – and I expect you have too – that man may not have survived in this dangerous world without his tamed wolves. I believe it. Fear for wolves or hating them today is something bizarre and sick. Modern man is practically safe, so wealthy, and all the losses will be covered if a beast breaks in. Even the Mid-East shepherds have mobile phones, and the Sami – reindeer breeder just can’t move anywhere without his shiny snowscooter. I think the modern man is experiencing a huge lack of natural, holistic action in his body and brain – at the same time experiencing the overpopulation stress – maybe that’s why his mind creates those super-trivial and hyper-exaggerated ghosts . For no much other reason there really is left. I agree Kathy. Very little has changed in “rural” america concerning the wolf. There is still this hysterical attitude which promotes the same old tired myths from 100 years ago. There are almost 380,000 elk in the NRM and somehow the decimated game herd talking point is still floated by “sportsmen” (all laugh here). Montana had 90,000 elk before wolves were reintroduced- now there are estimates of their eing asmanyas 140,000 today. Very little concerning the wolf issue makes any sense. Fox hunting in Britain, which would involve the fox being torn apart by dogs and similarly stag hunting has been banned by act of parliament only since 2004. Villagers in the northern Pakistani mountains of Hindukush and Karakorums would kill snow leopards raiding their livestock till 3 years ago. Then Planet Earth, in cooperation with a Pakistani journalist, was able to make a documentary on a snow leopard and her cub. This documentary was then showed to the villagers and all of them were in love and admiration for the beautiful creature. They then said that they feel so sorry that they were killing the beautiful cats in the past. I think it will take lots of dedicated people to educate people on preserving our natural heritage and let the nature take its own course in evolution. Suhail, wow, that was really something ! You are rite – it takes a lot of time & work to make real changes in people’s views. You are right, Suhail, showing film to villagers of the fabulous snow leopard was a good move to encourage respect and pride in having this rare and beautiful creature on their patch. Do you recall whether there was any local scheme mentioned to compensate them for livestock killed by snow leopards? I think I must have watched that or similar footage on our tv. One wonders how many snowl leopards are left. It was a Planet Earth’s footage with the voice of Sir Richard Attenborough. I am sure we are talking about the same program. I remember vaguely that Retrieverman had once provided the link to the program. Sir David Attenborough’s the natural history guy. My apologies for the slip. I knew that. Not in quite the same league, but until there was film of Scottish wildcats shown here very recently I don’t think many people believed they still existed. There is a small place just two miles from here called Cadsden, which I understand is a corruption of CATS DEN, so did they once live here or does the name refer to polecats – more likely the latter as there is also an old local pub close by called the Polecat. Interesting thing is that the polecat is back among us again having gradually returned from Wales to the west to where it had been driven by the attentions English gamekeepers around the 1890’s. A recovery of the local rabbit population after the rabbit desease myxamatosis faded also may have helped the polecat in its eastern comeback. The buzzard, another rabbit eater, has also recently returned to more eastern areas of England, where it now shares territory with the beautiful red kite, reintroduced here from Spain in 1989 after an absence of a century or more. 93 immigrant red kites have now increased to a remarkable approaching three thousand – the most successful reintroduction of a once vanquished English raptor ever. That is a thumbs up! A human war can be a good thing. The long-lasting war may well have saved that great and wealthy snow leopard population in the North-East Afghanistan. When a country is in war, its industry is not expanded when the big companies avoid the area.